Pfc. 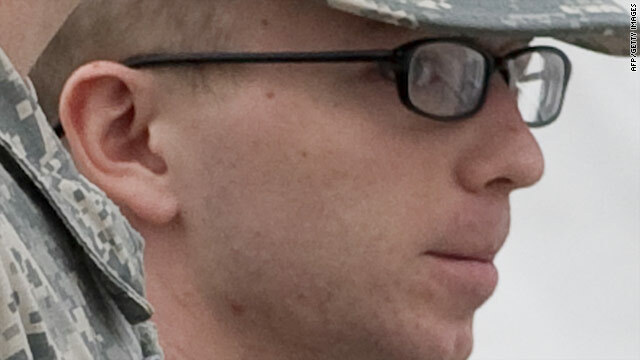 Bradley Manning, the U.S. Army soldier accused in the biggest leak of intelligence documents in the military's history, was formally charged Thursday. Aiding the enemy is a capital offense, but prosecutors are not seeking the death penalty. If convicted on all the charges, Manning will likely face life in prison. The 24-year-old is suspected of giving hundreds of thousands of secret documents to the WikiLeaks website.He was arraigned Thursday at Fort Meade, Maryland, before military judge Col. Denise Lind, marking the beginning of the court-martial process. Manning, who sat in his dress uniform with his hands clasped throughout the arraignment, deferred pleading guilty or not guilty to the charges until a later date. He can enter a plea any time before the start of the trial. The charges against him include aiding the enemy, wrongfully causing intelligence to be published on the Internet, transmitting national defense information and theft of public property or records. Manning's counsel also deferred choosing how the case will be tried. In a military court-martial, there are three options from which the defendant can choose - trial by a military judge, trial by a panel of senior officers or trial by a panel that includes one-third of enlisted noncommissioned officers. Holding off on entering a plea and choosing a forum for the trial could be part of the defense's overall strategy, according to Capt. John Haberland, a legal spokesman for U.S. Army Military District of Washington. The defense could be waiting to see the outcome of various motions, Haberland said. Motions were submitted at the arraignment, mostly dealing with information gathering for the defense, Haberland said. A hearing is set for March 15 and 16, where it is expected the defense and prosecution will be able to argue their motions. A trial start date has not been set. The prosecution asked for the trial to begin August 3, but the defense would like the trial to begin no later than June. If the prosecution gets its way, Manning would be in "pretrial confinement for over 800 days before the trial begins," said Manning's civilian attorney, David Coombs, arguing for a speedy trail. The defense also asked that the prosecution provide more specifics on what evidence or statements it intends to introduce at trial. Coombs posed a serious of questions to the overseeing military judge at the start of Thursday's proceedings. In what seemed like an effort to assess any potential bias, Coombs asked Lind what she had known of the Manning case before the arraignment. "I knew there was a case," Lind replied. When asked if she had formed any opinion about the case or the alleged leaks, Lind responded with a short "No." WikiLeaks, the international online group that publishes secret government documents it receives from outside sources, set off a firestorm a year and a half ago when it made public U.S. diplomatic cables and other sensitive documents, most of them pertaining to the Iraq and Afghanistan wars. The disclosure of hundreds of the documents continues to cast a shadow over the U.S. intelligence community. Pretty component to content. I just stumbled upon your web site and in accession capital to claim that I acquire in fact enjoyed account your blog posts. Any way I'll be subscribing for your augment or even I achievement you get admission to persistently quickly. It is the best time to make a few plans for the future and it is time to be happy. I've learn this put up and if I could I desire to recommend you some interesting issues or tips. Perhaps you can write next articles regarding this article. I desire to learn more things approximately it! Its such as you read my mind! You seem to grasp so much approximately this, like you wrote the ebook in it or something. I believe that you just can do with some percent to drive the message house a bit, however instead of that, that is fantastic blog. A fantastic read. I will definitely be back. Wow, marvelous weblog layout! How lengthy have you ever been blogging for? you made blogging glance easy. The whole look of your website is magnificent, as neatly as the content!